So many Christians go through their entire lives merely skimming the surface of the Word of God. Author, Missionary, and Pastor Rick Renner gives you a fresh, new way to dig below the surface and discover the untold riches of God's Word. 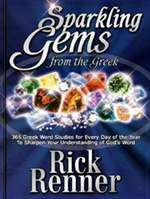 You can explore an entire year's worth of "sparkling gems" from the Bible. As you diligently apply these precious gems of truth to your everyday walk with God, your understanding of His Word will reach new heights that you never even imagined you could attain!